OMG! I Just Took God's Name In Vain! 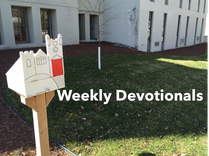 Dan Schmiechen is busy this week, so instead of his usual devotion, we offer this devotional from Still Speaking Daily Devotionals. Dan will be back next week. I never heard my mother or father swear. Well, almost never. I was shocked one time when my mother uttered an imprecation after dropping a pan on her foot. Among my youthful peers "swearing" more often than not meant referring to a variety of bodily functions. In my family these words were considered vulgar, but were not considered swearing. For them swearing was not about these so-called "dirty words" but about taking God's name in vain. When I was in confirmation the poor seminarian who taught us marched us through the Ten Commandments. When we came to #3, "You shall not take the name of the Lord your God in vain," he asked us what it meant. Click here to continue reading this week's devotion.